1 A None No Power Seat 1 A is an Economy Class Exit Row seat with extra legroom. The tray table is in the armrest, making the armrest immovable and slightly reducing seat width. There is no floor storage for this seat during take-off and landing. 1 B None No Power Seat 1 B is an Economy Class Exit Row seat with extra legroom. The tray table is in the armrest, making the armrest immovable and slightly reducing seat width. There is no floor storage for this seat during take-off and landing. 1 C None No Power Seat 1 C is an Economy Class Exit Row seat with extra legroom. The tray table is in the armrest, making the armrest immovable and slightly reducing seat width. There is no floor storage for this seat during take-off and landing. 1 E None No Power Seat 1 E is an Economy Class Exit Row seat with extra legroom. The tray table is in the armrest, making the armrest immovable and slightly reducing seat width. There is no floor storage for this seat during take-off and landing. 18 C None No Power Seat 18 C is an Economy Class seat in the last row of the plane that may not recline. The close proximity to the lavatory may be bothersome. 18 E None No Power Seat 18 E is an Economy Class seat in the last row of the plane that may not recline. The close proximity to the lavatory may be bothersome. 19 A None No Power Seat 19 A is an Economy Class seat in the last row of the plane that may not recline. The close proximity to the lavatory may be bothersome. 19 B None No Power Seat 19 B is an Economy Class seat in the last row of the plane that may not recline. The close proximity to the lavatory may be bothersome. Complementary meals, snacks, and beverages are served. Bangkok Airways flies the ATR 72-500 with 70 seats in a one-class configuration of Economy. There are 8 of these aircraft in the Bangkok Airways fleet. Great aisle seat, Im 192cm and the legspace was sufficient. If you want to get of the airplane quick, you should choose a seat in the back, they only use the back entrance for boarding. Just incredibly noisy engines the whole flight - not just on climb-out - and that's with ear plugs in. 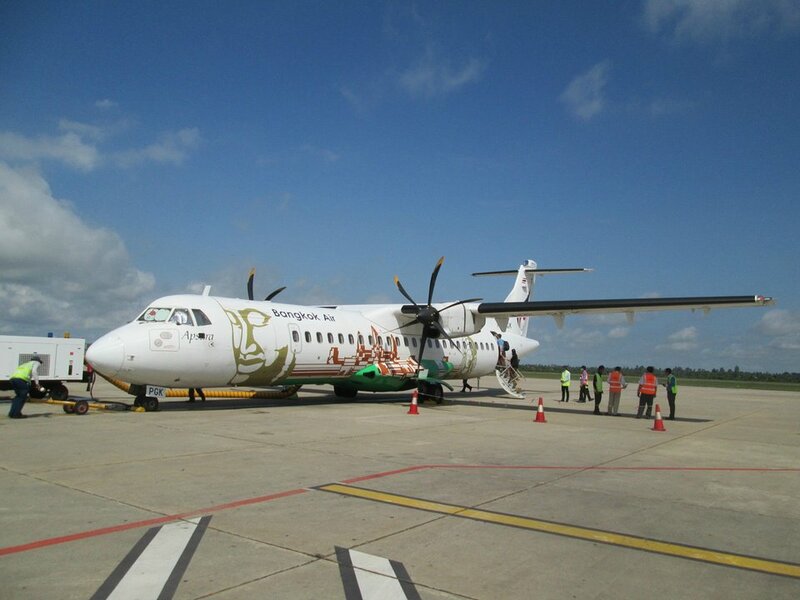 Bangkok Airways flies 1 versions of ATR 72-500.